NDT method which does not require contact or couplant, because the sound is directly generated within the material adjacent to the transducer. 1. No couplant is needed. Based on the transduction mechanism of EMAT, couplant is not required. This makes EMAT ideal for inspections at temperatures below the freezing point and above the evaporation point of liquid couplants. It also makes it convenient for situations where couplant handling would be impractical. 2. EMAT is a non-contact method. Although proximity is preferred, a physical contact between the transducer and the specimen under test is not required. 3. Dry Inspection. Since no couplant is needed, the EMAT inspection can be performed in a dry environment. 4. Less sensitive to surface condition. The requirements to surface smoothness are less stringent than Contact based Piezoeletric transducers; the only requirement is to remove loose scale and the like. 5. Easier for sensor deployment. Using piezoelectric transducer, the wave propagation angle in the test part is affected by Snell’s law. As a result, a small variation in sensor deployment may cause a significant change in the refracted angle. 6. Easier to generate SH-type waves. Using piezoelectric transducers, SH wave is difficult to couple to the test parts. EMAT provides a convenient means of generating SH bulk waves and SH guided waves. 5. 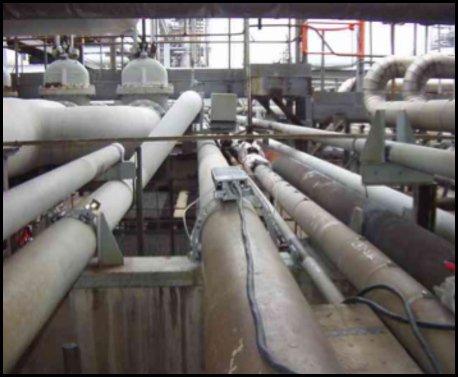 Various weld inspection for coil join, tubes and pipes.